Another highly requested product. 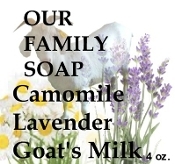 Our basic soap with the addition of goat's milk. Creates a extra soothing and moisturizing soap. Scented with a refreshing Camomile Lavender blend. Olive oil, coconut oil, palm oil, goat's milk, camomile lavender eo blend, shea butter, and Vitamin E.